A few weeks ago I told you I’d had the best night of my life when some of Laura’s teenage friends came for a sleep over. Well I had an even better night on Saturday night at the Cordell family party. 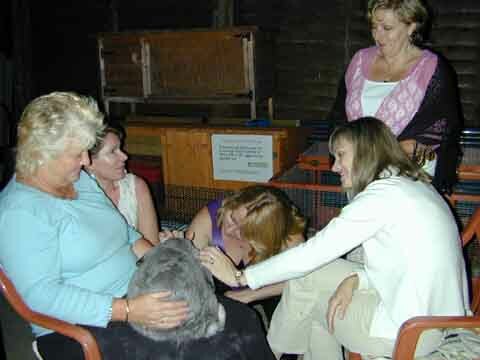 At one point I was surrounded by eight or nine bunny loving women, who all wanted nudgey cuddles with the Scruff Monster. I know what Tom Jones feels like when he goes on stage and has all those laydees screaming at him. These girls just couldn’t get enough of my fantastic good looks and rabbit charm. I could see men standing away from the action quite clearly wondering ‘how does he do it’? Well boys, between me and you, you’ll never do it, even if you look like George Clooney. Forget nose jobs and hair extensions, what you need is a rabbit job - two lovely long ears, a well-toned body with powerful muscles, soft silky hair and an irresistible twitchy nose. Forget come-to-bed eyes, what you need are feed-me eyes. Aside from the wonderful laydees at Saturday’s party, it was a great night, made especially great by Martine’s cooking. Sadly, she didn’t see fit to share any of her lovely food with me, but in light of my other party pleasures, I will forgive her. Of course I was extremely tired after being the life and soul of the party all night and had no energy to try to clear up any leftovers on the floor, but I’m sure Tess took up that job without any grumbling. She’s so much better than she has been over the past few weeks. Going back to Martine, she’s a frequent helper at Bobtails and comes all the way from North London on the train. She adopted Mr Duck, who, after terrorising her cats, became Git Face and at one stage was referred to as Disney, but is more commonly known as Git Face. Respect to any bunny who commands the name Git Face and can terrorise cats. Other party animals who also need nudgey cuddles are Jim and Delia’s son Brad and his lovely girlfriend Sarah, who also failed to feed me party food but were great hosts. While the regular Bobtails clan failed to acknowledge my super star status, the guests were great – bringing gifts and foody treats. Had they turned up to any other party with a bottle and a bag of dandelion leaves, or a bunch of flowers and a bunch of carrots, they would probably have been turned away, but all bunny gifts were greatly received. Jill, who sells animal-related gifts at Absolutely Animals, brought a hand-painted bowl which is very special, and while I was keen to share some of the cabbage and carrots with the lads up in the top shed, I thought I would keep the bowl for my pad, just in case I welcome a special laydee dinner guest one day. Talking of the laydees in my life, I got my very first email this week – and it was from a LAYDEE!!! She’s called Bugsy and said she was coming to visit Bobtails and looking forward to a nudgey cuddle. But then she went on to say she was hoping to marry Jimmy the French lop who was at the rescue not so long ago and my heart sank. Putting my own sadness aside, because you really do sound like a lovely girl Bugsy, good luck to you both and I hope you’re very happy. When’s the stag do Jimmy? One day I’ll find my girl – I just know it. In the meantime, I’m very much looking forward to Laura coming back off holidays. I’ve really missed her – as has the squawking shuttlecock (Joe) in the dining room. If he’s not shouting at me, he’s calling for Laura. Now here’s something that will bring a tear to your eye – remember Holly from last week? She’s an unwanted pet who was left in her hutch for two years and was in a terrible state when she was brought in here. She was offered two new homes this week and I really can see why – she’s just gorgeous and desperate for a cuddle. It’s a shame she had to suffer two years of living in squalor before she was brought in here. At least now she can have a shot at the happiness she deserves. Good on you Holly. Week after week I tell you about some of the amazing stories bunnies come into the rescue with. This week I want to tell you about Rusty and Dusty and all their babies. We got a call from some people living in a tower block in Clapham. They had a mum, Rusty, and four newborn buns living in a tiny hutch on their balcony. Running free on the balcony was dad Dusty and two six-week old babies, who at any time could have fallen over the balcony. Honestly, you couldn’t make this stuff up! What’s so special about these guys is that dad is bringing up two babies on his own and doing a fantastic job of it. Usually us blokes don’t like to get involved and can be a bit grumpy with our young, but Dusty is washing and fussing his offspring and really caring for them. He was whisked off on Friday to have his bits and bobs removed (ouch) and will hopefully find a new home for himself and his two young ones. Meanwhile, mum is settling into her new home with her very cute little babies. We’ve also had five lion head babies brought into the rescue this week, so if you are looking to welcome a new bun or two into your home, then pay us a visit because they are gorgeous – as we all are.